Heat pumps are reversible devices that can be used for both heating and cooling. They work by transferring heat from one place to another, and can achieve efficiencies greater than 100%. In most applications, air-source heat pumps (ASHPs) are driven by electricity. They’re key function is to transfer heat into or out of a building. They work based on a refrigeration cycle, just like in a household refrigerator. 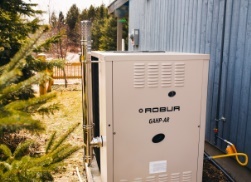 Gas-fired heat pumps (GHPs) use natural gas to drive their refrigeration cycle. They come in two types: gas-engine heat pumps (GEHPs) and gas-absorption heat pumps (GAHPs). The former uses a natural gas-fired engine to power a compressor, which then drives the same refrigeration cycle that ASHPs commonly use, while the latter uses the heat produced from burning natural gas to power an ammonia-water absorption cycle. Contrary to many other refrigerants, ammonia has zero global warming potential. STEP is currently evaluating the performance of a Robur GAHP-AR. The GAHP will be monitored over a two-year period at the Archetype Sustainable House, where it will provide the heating and cooling requirements for both semidetached houses. Using experimental data, detailed modeling and simulation work will be conducted to extrapolate the results to other climates and building types. This is the first of a four-project series aimed at examining high-impact carbon-saving technologies. STEP is conducting performance evaluations of four carbon-saving technologies, each with reasonable potential for dissemination within the Canadian market. Qualitative aspects and the potential for a business case for each technology are also considered in order to address potential barriers to uptake of the technologies. As the projects are completed, key findings will be delivered to relevant stakeholders, as well as be made available to the public. The four-part series of projects is funded by The Atmospheric Fund.